Tracing & Tracking. Marking/Coding Inkjet Devices. Marking/coding inkjet devices print barcodes, addresses, and dates directly onto products like bottles, cans, and glass. These machines are designed for high-volume processing while managing variable data. A number of industries benefit from marking/coding printers. Food packaging, pharmaceutical, and beverage sectors utilize these products to satisfy requirements for quality and safety in regards to tracking and traceability. Systems are available as turnkey solutions as well as bespoke devices. Above: Examples of cans with information printed using the Domino Ax-Series of printers. In the last 40 years, the marking/coding market has grown significantly due to needs for variable data and faster speeds. Traditional methods of marking/coding typically included stamps produced with replaceable type on a hot stamped coder. Since then, marking/coding printing has evolved with the ability to print on almost any rigid or flexible packaging material available. With this, thermal inkjet printing appeared—eliminating multiple component inks necessary to use the technology. 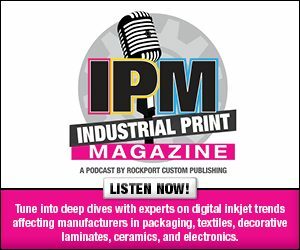 However, Jon Jensen, marking and coding specialist, InkJet, Inc., says the technology is limited by minimal compatible substrates and minimized application flexibility. Despite this, online digital systems have marked expiration and batch/lot codes for many years. “Digital print technology for marking and coding offers manufacturers better flexibility, quality, and customization,” comments Jim Mueller, director of sales/marketing, small character technologies, Engage Technologies Corporation. He says continuous inkjet (CIJ) technology handles high speeds and a large variety of materials. Marking/coding is now driven by legislative, manufacturing, and supply chain requirements to provide food production traceability and better marketplace product management. Depending on the product, supply chains can track packages through distribution and onto point of sale or consumption, says Bill Bonaccorsi, VP of marketing, North America, Domino Digital Printing. The most visible form of marking/coding is in consumer products with expiration dates. Marking/coding inkjet devices are designed for high volumes and variable data. Variable data ensures that coding solutions produce the required production line, ingredient list, operator batch, expiration data, and manufacturing time in the code. “All of the items have the potential to change literally by the second or less frequently depending on the application,” shares Bonaccorsi. Inkjet systems offer the flexibility for new codes to be produced as written in real time. Variable data is also useful for promotional coding by providing unique numbers, patterns, or barcodes for lottery and promotions. Data matrix or 2D codes are produced to guide a consumer to a website or other source about the product or promotion. According to Bonaccorsi, barcodes are also read by robots and infrastructure machinery in supply chains and manufacturing processes to direct action. These devices handle high production speeds with fast drying inks. Along with expiration, date, time, and lot coding, Mueller says printers now have processing speeds capable of printing unique codes to each product. This is becoming more prevalent for serialization and gaming industries. Marking/coding speeds range from one foot per minute (fpm) to 1,300 fpm to produce high-volume products without bottlenecks in production. “The ability to print in a blow molder at 2,200 bottles per minute or mark wire at 300 meters per minute (mpm) and print at that speed continuously for days on end reduces the cost of the product significantly,” offers Jensen. The newest advancements to marking/coding inkjet devices are designed with speed, quality, and ease in mind. The marking/coding industry is dependent on speed and the ability to produce continuous high runs over time. This requires technology that allows the first and the millionth code to be the same. “Every inkjet machine can produce a good code, producing these consistently over a long period of time is the tricky bit,” comments Bonaccorsi. Newer devices are designed with features for accurate repeatability, offering the perfect ink drop each time. Most of today’s available systems have self-cleaning printheads, automatic viscosity controls, and a variety of functions that promote user friendliness and integration. For example, InkJet, Inc. recently released a product that produces high-quality code printing at distances up to three inches away. Networking, connectivity, integration, and user friendliness are also new developments in marking/coding systems. “Primary product and secondary packaging printers that can be networked and operated from one platform are required more frequently,” shares Mueller. Printers are integrated into production machine controls to make each production line component visible to the network. Most marking/coding systems use one color with the majority of devices configured with black ink, although other colors are available. Colored inks are often used for dark-colored objects like yellow ink on brown beer bottles, white ink on black cables, or to even highlight danger with the use of red. “The choice of ink is not driven simply by color and aesthetics but by many other critical parameters,” explains Bonaccorsi. These include characteristics like adhesion and whether it will stick to the product, smudge during production, erase and rub off, or fade in sunlight. Several ink types are available to suit a variety of applications, environmental conditions, and substrates. For example, Bonaccorsi says a black ink for a can of beans does not have to do the same job as a black ink coding onto plasterboard or electric cables. While countless industries benefit from the use of marking/coding inkjet printers, some fare better than others. Many customers are found in food packaging, bottling and canning, wire and cable, and pharmaceutical sectors. Jensen believes these industries particularly benefit from marking/coding because it provides tracking and traceability for quality and safety, both for manufacturers and consumers. When looking at devices for marking/coding, companies consider multiple factors like speed, flexibility, cost of operation, ease of use, permanency, and chemical resistances. The amount of products and materials printed with marking/coding inkjet devices is nearly limitless. Products range from beverage, food, soap, and boxes to electronics, medical devices, automotive, and building materials. Typical materials include cable, cloth, concrete, corrugate, glass, metal, paper, plastic, wire, and wood. A variety of vendors offer marking/coding inkjet printers with multiple color options and features for production environments. Domino released the Ax-Series in October 2016 for several marking/coding sectors including beverage, food, and pharmaceuticals. It prints up to nine meters per second with up to four lines of print and 255 characters per line. The Ax-Series is service free—eliminating the need for conventional preventative maintenance—and uses Domino’s i-Pulse printheads with precision ink drop generation technology. Engage Technologies is the parent company of Squid Ink, which released the Streamline 5 in July 2017 for food, beverage, and industrial marking applications. The Streamline 5 prints up to five lines of text at 1,000 fpm, ten characters per inch, and one print line per 5×5 matrix. According to Mueller, it is the first CIJ printer designed without a built-in user interface and is available for $6,795. The Hitachi America, Ltd. UX-D160W Dynamic Cartridge Model is a CIJ multipurpose marking/coding printer capable of printing up to six lines. A 10.4-inch display and intuitive parameter illustrations reduce the complexity found in traditional smaller screen printers. Hitachi’s ink cartridges are easily changed without stopping production. Released in August 2018, the InkJet, Inc. DuraCode CIJ printer is primarily designed to deliver high-quality marking/coding for packaging applications. It operates at up to 1,050 fpm and offers print data options through network and local scanners. It has a modular, protected IP-55 rated industrial structure and the ability to quickly change the filter and fluids to keep manufacturing lines moving. Keyence Corporation offers the CIJ MK-U Series available with black, white, and yellow ink. The series prints up to six lines at a maximum speed of 2,525 characters per second. It is equipped with an LED pointer that indicates the print location for easy alignment, retooling, and product changeover. The Paul Leibinger GmbH & Co. KG JET Rapid Wire high-speed inkjet printer is a non-impact marking/coding CIJ system with single line printing speeds of up to 1,000 mpm. It’s ideally suited for cables, pipes, and wires with ultra-high throughput and maximum extrusion productivity. Today’s marking/coding inkjet devices are designed with faster speeds, higher quality, and ease of use. In any industry that demands accurate product tracking and traceability, digital devices capable of variable data and high-volume processing are just the solution.